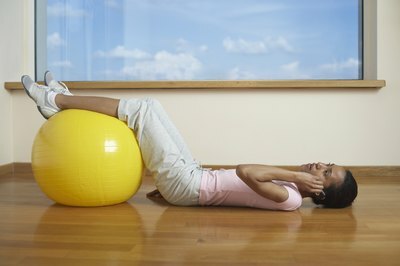 What Muscles Does the Stability Ball Leg Curl Work? The stability ball leg curl works a variety of muscles. The stability ball leg curl, also known as the stability ball hamstring curl, focuses primarily on the gluteus maximus and hamstring muscles. But many secondary muscles receive a workout as well. These muscles include the rectus abdominis, transverse abdominis, gluteus medius, gluteus minimus, gastrocnemius and the obliques. To perform the stability ball leg curl, lie flat on your back with the back of your legs and heels on top of the stability ball. Extend your arms out to your side to aid in balance. While exhaling, raise your hips off the floor while pushing your legs into the ball for stability. Slowly contract your hamstrings and move your heels toward your hips until you can rest the soles of your feet on the top of the ball. Slowly inhale while lowering yourself back to the starting position. The gluteus muscles consist of the gluteus maximus, gluteus medius and gluteus minimus. The gluteus maximus muscles are the largest of the gluteal muscles. They are responsible for straightening the thigh at the hip and lifting the leg out to the side. The muscle allows you to walk upright. The gluteus medius is on the side of the hip and is responsible for abduction and rotation of the femur at the hip. The gluteus minimus is located below the medius, and they work together in femur rotation. The stability ball leg curl works to strengthen all of these muscles. In addition to the hamstrings, the stability ball leg curl exercise works the gastrocnemius muscles. The hamstrings consist of three muscles and are located at the back of the upper leg. The three muscles are the semimembranosus, the semitendinosus and the biceps femoris. Together they work to straighten the hip joint and bend the knee. The gastrocnemius muscle, also known as the leg triceps, is the large muscle of the calf. It works to pull the heel up and allows the foot to extend downward. In addition to the legs and buttocks, the stability ball leg curl exercise gives a workout to your abdominal muscles. There are four main muscle groups making up your abdominals. They are the transversus abdominis, rectus abdominis and the external an internal obliques. The transversus abdominis works to stabilize the trunk and maintain internal pressure. The rectus abdominis, also known as the muscles that make up the “six pack,” allows movement between the rib cage and pelvis. Your external and internal oblique muscles allow your core to twist. Keeping your core abdominal muscles strong creates a foundation for all movement. Does a Shorter Stride on an Elliptical Work Calves? What Exercise Works the Peroneus Longus? What Is the Difference Between Internal Rotation Exercise & External Rotation Exercise?